Looking for something a little different than a bronze medallion to mark this year's special occasion? Our AA Anniversary Lighters fit the bill perfectly! What a great way to celebrate your sobriety! This quality matte pink lighter features our traditional AA anniversary medallion design with any year designation you desire -- or, none at all. 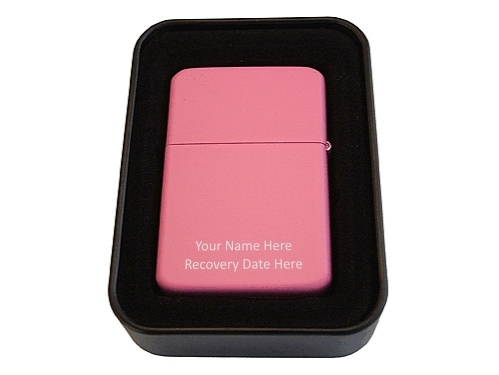 Optionally laser engrave the reverse side with a name, recovery date, or special message for only $5.00 more! 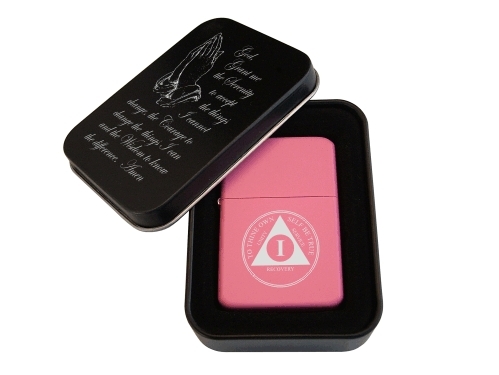 Each lighter comes in an attractive gift tin which is beautifully engraved with our beloved Serenity Prayer. They are perfect for keeping special keepsakes and small treasures! Or, use the tin as a God Box!